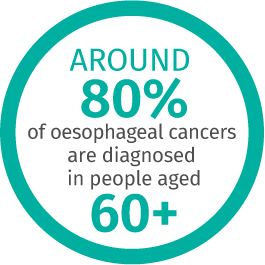 Oesophageal cancer occurs when malignant cancer cells have formed in the tissue of the oesophagus, the tube that transports food from your mouth to your stomach. Oesophageal cancer can occur in any part of the oesophagus and within different cells. Oesophageal cancer that occurs in the cells lining the mucosa (the inner layer of the oesophagus) is called squamous cell carcinoma. They are more frequently found in the upper and middle sections of the oesophagus. Oesophageal cancers in the lower part of the oesophagus usually arise from the glandular cells of the mucosa. The role of these glands is to produce mucus, which helps make swallowed food slide more easily down the oesophagus. These types of cancer are called adenocarcinomas of the oesophagus.  In Australia and western countries, oesophageal cancer is more commonly found in the gastro-oesophageal junction – the lower end of the oesophagus where it joins the stomach. Early stages of oesophageal cancer often do not cause any symptoms or only show in the form of non-specific symptoms that can also be commonly found in other illnesses. Most oesophageal cancer diagnoses occur during more advanced stages of the disease. Episodes of choking on food or fluids coming back up after “catching” in the throat. Development of upper abdominal discomfort especially while eating. In Australia, it is estimated that over 1,600 people will be diagnosed with oesophageal cancer in 2018. Oesophageal cancer is more common in men, with males more than twice as likely as females to be diagnosed with the disease and die from it. It is an uncommon cancer but the incidence of adenocarcinoma of the oesophagus in Australia is increasing. In 2018 it is estimated that oesophageal cancer will claim 1,447 lives. After the initial diagnosis, individuals with oesophageal cancer have a 21% chance of surviving for at least five years. The following factors may increase the risk of developing oesophageal cancer. Personal or family history of gastro-oesophageal illnesses, including hiatus hernias, polyps, ulcers or oesophagitis. Pre-existing medical conditions, such as gastro-oesophageal reflux disease (GORD), and Barrett’s oesophagus. Frequent consumption of smoked, salted or pickled food. The type of diagnostic tests will vary depending on the symptoms. The most common test is an upper endoscopy alongside imaging scans such as computed tomography/ positron emission tomography (CT/PET scans), or Magnetic Resonance Imaging (MRI) allowing the medical practitioner to examine the oesophagus in more detail. An endoscopy allows the doctor to examine the upper digestive tract by using a thin flexible tube with a camera. During the procedure, the doctor may also take a small sample of tissue called a biopsy, for examination under a microscope to see if there are any cancer cells. A “barium swallow” may also be performed for a complete diagnosis of oesophageal cancer. During a barium swallow, the individual will drink a solution containing a metallic compound called Barium Sulfate. As the Barium Sulfate travels through the digestive system, an x-ray investigation tracks the movement to see if there are any abnormalities in the oesophagus. Scans of the oesophagus and nearby organs may be performed to create a clearer picture for doctors to see if there is any evidence of cancer or if it has spread. This can include x-rays, CT/PET scans and MRI. The type of treatment depends on the location of the cancer and whether it is at an advanced stage or if it has spread to other organs and parts of the body. Surgery is commonly recommended for treatment. Chemotherapy and radiotherapy may also be recommended in combination with surgery, or for cases of advanced oesophageal cancer, when surgery is no longer possible. Currently there is no standard screening test for oesophageal cancer in Australia. There are many ways to reduce the chance of developing oesophageal cancer.. Protective steps include: avoiding smoking of tobacco or quitting smoking and maintaining a healthy body weight. Changes in lifestyle habits, such as having a diet high in fresh vegetables and fruit, and reducing foods with high levels of salt will also reduce the risks of developing oesophageal cancer.